Obama: "We are Not Doomed to Endless Gridlock"
At a Wednesday afternoon press conference, President Obama celebrated the unexpectedly productive lame duck session of Congress, calling it evidence that "we are not doomed to endless gridlock." He also cast the 2010 lame duck session as "the most productive post-election period in decades." "I think it's fair to say that this has been the most productive post election period we've had in decades, and it comes on the heels of the most productive two years that we've had in generations," Mr. Obama told reporters shortly before leaving for a vacation in Hawaii. Pointing to a newly-ratified arms deal with Russia, the repeal of "Don't Ask, Don't Tell," the comprehensive tax compromise, and a 9/11 health bill that today cleared the Senate, Mr. Obama stressed that Congress had overcome partisan politics to work together. "A lot of folks in this town predicted that after the midterm elections, Washington would be headed for more partisanship and more gridlock," Mr. Obama said. "And instead this has been a season of progress for the American people." "We don't have to agree on 100 percent to get things done that enhance the lives of families all across America," he continued. "If we can sustain that spirit, regardless of how the politics play out in 2012, we can be better for it." Mr. Obama noted, however, that not all of his legislative priorities had been successful - and emphasized his disappointment in Congress's failure to pass a bill that would have provided a path to citizenship for some upstanding illegal immigrants who were brought to America as children. "I am very disappointed Congress wasn't able to pass the DREAM Act, so we can stop punishing kids for the actions of their parents and allow them to serve in the military or earn an education and contribute their talents to the country where they grew up," he said. Obama called the failure of the DREAM Act "maybe my biggest disappointment" and vowed that "this administration is determined to get immigration reform done." 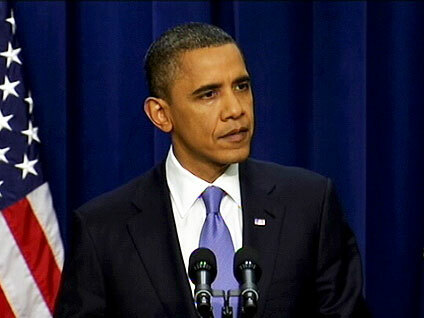 At a minimum, Mr. Obama said, "we should be able to get the DREAM Act done." Obama said the next Congress will focus on how to cut spending and expressed disappointment that the current Congress had failed to address the deficit.